Ref: MF098 Once there was a time when porters took care of luggage. Functional a century ago; now an elegant and decorative treasure. Built to be loaded in baggage rail-carts and ships holds. 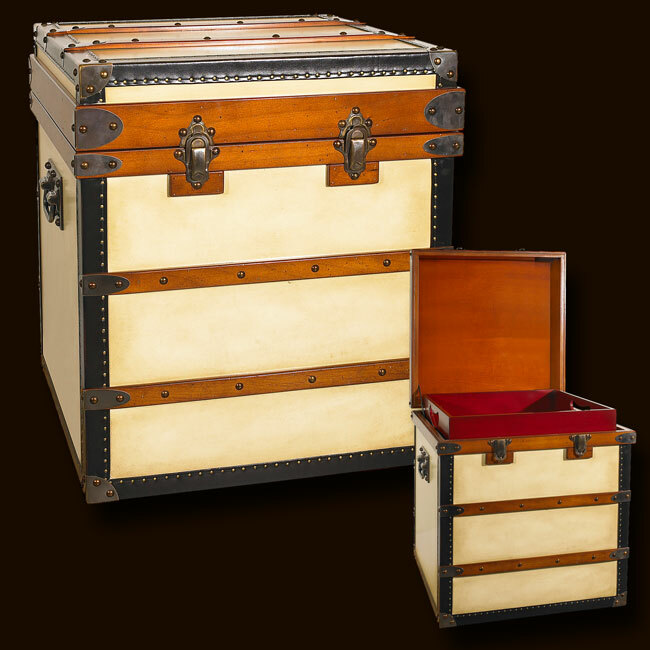 Royalty and upper-class in the Belle Époque traveled with specialized trunks. Armoires, bars, libraries, and of course the ubiquitous hat-trunks. After all, hats were de rigeur at the time! Antique French trunks made by legendary makers now fetch exorbitant sums at auction. Our trunks are inspired by the old, classic, travel trunks of yore. True canvas covered. Solid brass hardware. Steamer-varnished hardwood slats. Ideal as an end table, combining storage with functionality and design! Roomy and strong, an heirloom for future generations.